For this project, Ms. Gullons has always wanted her students to work in the classroom using the school's netbooks to work on projects. She proposed for us to create a summary sheet on how to set up wi-fi in the classroom. Not only was Ms. Gullons in need of this but after she had told a few science teachers about this project, many of the science department teachers requested this as well. We have created a simple summary sheet that guides anyone on how to set up wireless connection in a classroom. The summary sheet was originally created using Google Docs but embedding images was quite difficult so it was continued using Microsoft Word. A document is now finished with the step-by-step instructions on how to set up wi-fi. By clicking here, anyone can download the file and discover how to equip their classroom with Internet access. A Prezi tutorial has also been completed to bring the entire project to another level, making it a bit more visually-engaging. The tutorial takes the summary sheet to a more visual aspect and helps teachers concentrate on each step to understand the process with more precision. 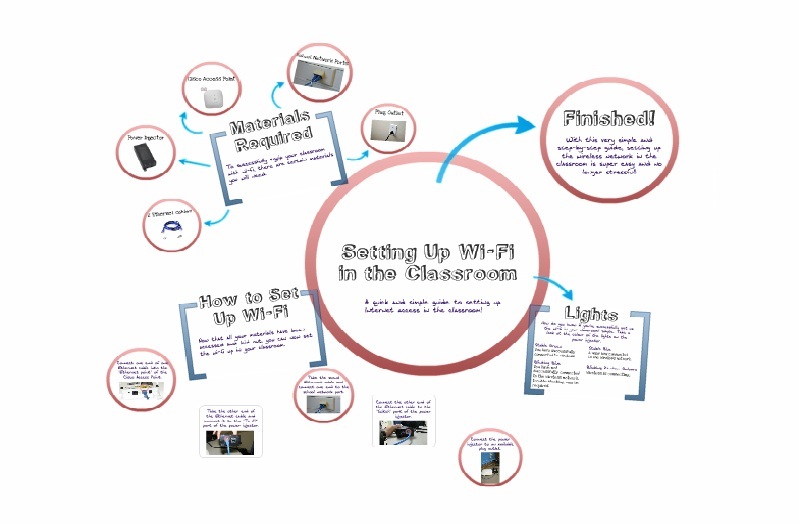 The following link will lead to the Prezi tutorial that will help any viewers learn how to set up wi-fi in a classroom and can be watched over and over again, saved and shared for future references. The Prezi tutorial can be used by any other teachers in any subject. This allows every teacher the ability to set up wi-fi so their students are able to research during class and ask their teachers questions while completing their task. For Prezi itself, it can be used in every subject and class because it is an amazing technology resource to use when it comes to presentations. It is very engaging because it is so visually-pleasing and cinematic that it will capture and hold others' attention rather than doing the typical Powerpoint presentation. Teachers can also use Prezi because it is so simple with its built-in templates, teachers can input the exact same information they would onto a board, overhead projector or Powerpoint into Prezi to create a different learning experience for students.